Upcoming Cadillac XT5 Caught Completely Undisguised! Wallace Chevrolet > Cadillac > Upcoming Cadillac XT5 Caught Completely Undisguised! We’re huge fans of the Cadillac SRX. It’s comfortable, spacious, luxurious, and loads of fun behind the wheel. Unfortunately, it’s days are numbered, and Cadillac is set to replace the SRX with a new, slightly smaller compact crossover called the XT5. 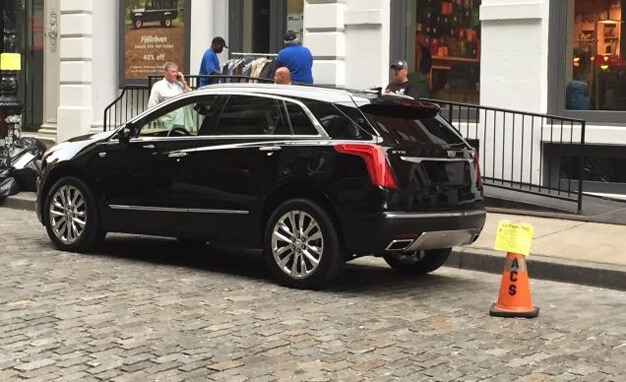 While Cadillac has remained mum on the SRX’s upcoming replacement, spy photographers recently caught the new vehicle completely undisguised during a photoshoot in New York, ahead of its planned debut early next year. It’s all sculpted lines and curves on the back of the 2017 Cadillac XT5. We’re bag fans of the sculpted headlights and grill and we can’t wait to see the all-new Cadillac on the road. Reports indicate it could come to market with a 2.0L four-cylinder (estimated at 265 hp), a 3.6L V6 (estimated at 335 hp) and the option of all-wheel drive. We also wouldn’t be surprised to see a hybrid model offered as well. The all-new, first-ever Cadillac CT5 will go on sale sometime in 2016. Stay tuned for more!